EVERY OF THE STUFF: SON OF A SAILOR // PRESS: brooklyn magazine likes us! 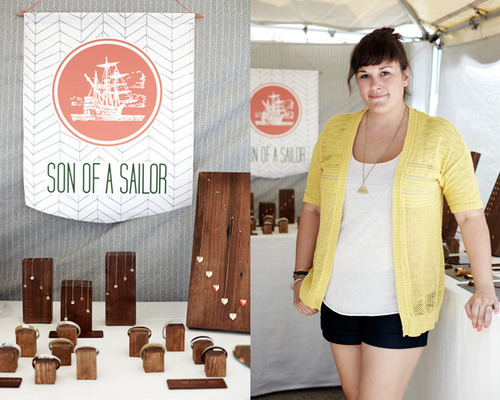 SON OF A SAILOR // PRESS: brooklyn magazine likes us! but, i wanted to share this link with you guys—-we’re thrilled to have been chosen by Brooklyn Magazine as one of “The 10 best things we saw at the Renegade Craft Fair!” We’re honored to be among the ranks of some other awesome designers, and their photographer, Winnie Au, got some awesome shots. I was pretty certain that my photo was going to be a mess of hot, wind-blown squinting into the sun, but she rocked it! we’ll be back with more about the trip, but for now, thanks so much to Brooklyn Magazine, to Rebecca Willa Davis for selecting us, and to Winnie Au for getting some great photos!